Govt. 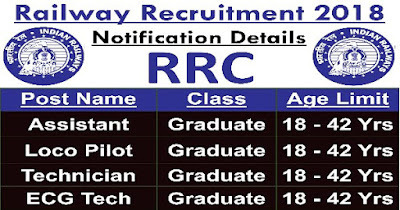 Jobs: Railway Recruitment Group A & B Posts 2018 . Railway Recruitment Group A & B Posts 2018 . This jobs is for the Group “A” & “B”. Candidate from the Bilaspur, Chhattisgarh will apply for this job. This is a great chance for interested candidates. This is the great opportunity who want job in railway department don't miss this great chance apply now . Job Location: Bilaspur , chattisgarh. Post Name: Group A & Group B. 12th / ITI / Diploma / Degree Pass for more details Please Check Official job link provided below. Last Date for Submission of Application: 17 september 2018.